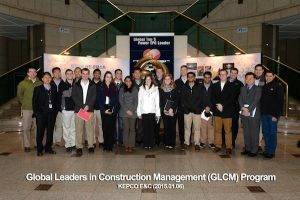 Our first office visit in Seoul, South Korea began with Kepco Engineering and Construction Company, LLC. 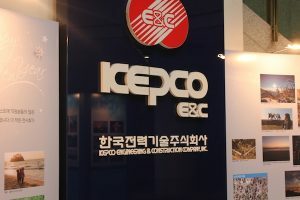 Kepco E&C was founded in 1975 and has been growing ever since. Kepco is a global top 5 power EPC leader and is present in several countries including France, Ghana, Saudi Arabia, and many more. With over 2,300 employees, of which over 1750 are engineers, Kepco boasts of the 62% of employees that hold an advanced degree, and 58% of employees with over 20 years of experience in the business. With such statistics, it’s no wonder Kepco wants to show off their numbers. Nuclear power in Korea began with research for the first reactor in 1959. Since then, 28 nuclear power plants have been added to Korea, of which 23 are in operation and 5 are under construction. Since the 1970s, Kepco has grown from looking into the foundation and development of power design technology to technical independence followed by advances in the global market. Since 1993, all local nuclear power plants are now independently designed by Kepco. With several contract awards and overall company awards, Kepco is maintaining a positive recognition in the nuclear power industry. The first presenter, Mr. 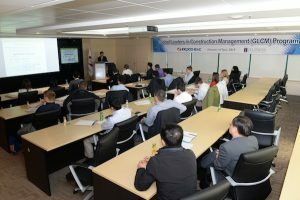 Sung Myeon Yi, General Manager of Nuclear Power Overseas Marketing Team, gave us a brief overview of nuclear power plants, as well as a look at the safety design and construction technology of APR1400. The APR1400 is designed with safety and long term durability in mind. Overall, the design would have a lower generation cost than coal-fired plants. The interesting features to note about the nuclear power plant design is the use of seawater as a cooling system. Taking advantage of the natural resources is a positive way to incorporate it’s uses into the plant. Our second presenter, Mr. Chang-kwon Kim, PMP, talked us through the project management portion of nuclear power plants. The most noticeable was the advanced 4D video that walked us through the construction of a nuclear power plant. Watching the formation from the ground up definitely amazed us all. In addition to being mesmerized by the video, we were shocked to hear about the quantity of materials that goes in to building a nuclear power plant. Some of the most noticeable were the re-bar that is 2.4 times that of the amount used in the Buri Khalifa, steel that is 3 times more than the Eiffel Tower in Paris, and concrete that is enough to fill 170,000 mixer trucks. Such vast numbers for just one plant. In addition to quantity of construction materials, the quantity of engineering documents was tremendous. It was said that over 120,000 sheets were a part of the drawings. There were 2,800 calculations each, 1,100 reports each, 200 procurement specifications each, 24 construction specifications each, and over 50,000 supplier drawings and documents. No wonder the engineering period for a nuclear power plant takes about 10 years and will have at its peak 400 engineers working! 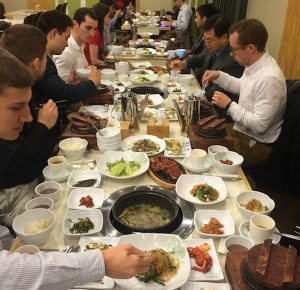 After a delicious Korean lunch, where we had time to each speak one on one with many of the employees, Overall, Kepco was able to give GLCM a great look into building nuclear power plants and we are looking forward to applying that knowledge on our future nuclear power plant visit!